Project goals : To promote and strengthen the friendship, cooperation, and exchange of ideas among the lacquer communities of Asia. Conference purpose : To organize future project events. On 20-21 February 2016, a project event will take place in Chiang Mai, Thailand; in 2017 in Vietnam; and in 2018 in Cambodia. 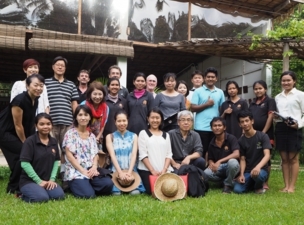 Organizers：Asian Lacquer Craft Exchange Research Project. 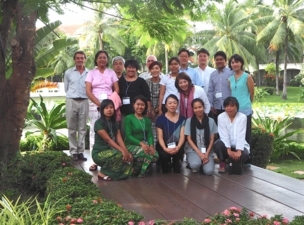 The lectures and seminar were held at the Sofitel Angkor. In the morning there were lectures on the current state of lacquer crafts in each country. Opening remarks were by Eric Stocker followed by and short history of the Project and an overview of future plans and goals by Sakurako Matsushima. 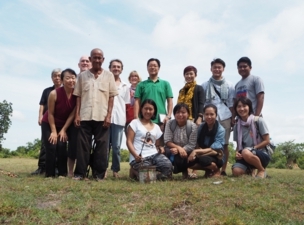 Besides the Project members, about 25 individuals from the Siem Reap community attended. Sakurako Matsushima discussed the history of lacquer from ancient times to the recent past. She reviewed the history of contacts between lacquer using societies in East and Southeast Asia and how both materials and techniques were exchanged. Then she gave an overview of the Japanese lacquer crafts and industry. 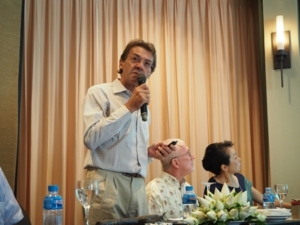 Eric Stocker first spoke about the history of lacquer in Cambodia. Then, his own experience of in 1998 finding one lacquer sap collector in Kampong Thom supplying woodworking craftsmen in nearby villages. A decade later the craft industry had disappeared. 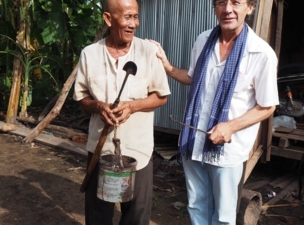 Looking for someone who was still collecting lacquer sap, he met Mr. Ta Ly who knew how to collect the sap. 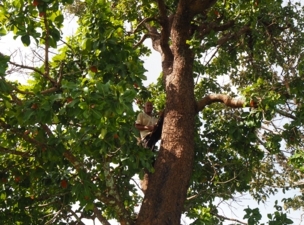 Eric asked Ta Ly to collect sap to use in his workshop and now lacquer is again being collected and used in the craft industry in Cambodia. 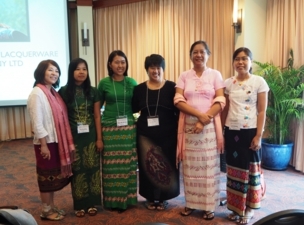 Maw Maw Aung and Malar Win Maung spoke of the challenges facing the lacquer craft industry in Myanmar. Costs were increasing and margins were low. The price of lacquer and other materials were continuing to rise. Both Maw Maw and Malar noted that there were not enough accessible lacquer trees in the wild and that there were no plantations. They also commented that the industry was tourism dependent, that it was mostly a retail trade with few foreign exports, and that in Myanmar shipping charges were still unreasonably high. One side effect of tourism is an ever higher turnover rate as workers leave for better paying jobs in the tourist industry. This, according to both speakers, has led to a shortage of skilled craftspeople and fewer apprentices for masters to pass there knowledge on to. A serious issue. On the positive side, Maw Maw noted that Bagan was a growing tourist destination and that Bagan lacquer was a well known product. She believed that this was a stable base to expand from. Sumanatsya Voharn, after introducing the Chiang Mai University Art Department, discussed the situation in Lanna, northern Thailand. One point she discussed was that all lacquer sap is imported from Myanmar. 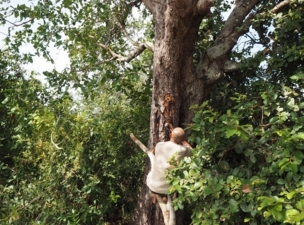 The lacquer tree is a protected species and collecting the sap is currently forbidden. Tradition, she said, was another issue. Young Thais know little about Chiang Mai’s role in the development of SE Asian lacquer crafts. The aging craftspeople have few apprentices to pass their skills on to. Since lacquer is a time consuming process, many commercial lacquer factories have opted to use chemical varnish and call their products “lacquer”. Turning to artistry, Jib noted the low quality of much lacquerware and adherence to traditional design in a modern forward looking city. She strongly believed that artists needed to learn about the lacquer medium and material and that it was for artists to develop new design ideas and directions for lacquer. She stated that more contact and exchanges are necessary between lacquer cultures. Saeko Ando reported on the economics driven craft industry in Vietnam contrasting it with its unique lacquer painting culture. Natural lacquer and traditional techniques are used in the craft industry in name only. Chemical varnish and plastics are used to mass produce “handicrafts” for tourists and for export. Unfortunately, producers often claim that their products are made with lacquer using traditional methods. In contrast, Saeko reported that Vietnam had a vibrant artist community centered around lacquer painting. Lacquer painting developed in colonial times as the result of the combining of western painting with local materials. She presented some of the techniques used in lacquer painting. She noted that there was some commercialization of this art which has led to declining skill levels and the use of chemical varnish. Natsuki Kurimoto and Akiyoshi Totoki focused on developments in the Japanese lacquer world. Natuski discussed the importance of commissioned lacquer artwork in public spaces as a way to promote public understanding and appreciation of lacquer art. He showed slides of large lacquer art objects currently in public places in Japan. Akiyoshi discussed Japanese craft design. He traced its modern development from the British arts and crafts movement. He stressed the importance of design in Japanese tableware and showed a number of examples of innovative craft design. 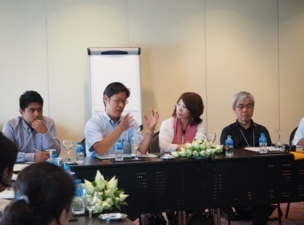 Discussion: How best to improve our program and expand its reach in the SE Asian lacquer community. Summary: After a review of the morning session by Ken Dillon, the floor was opened for discussion by topic area. Maw Mau stated that in Myanmar most workshop lacquerware production is compartmentalized with workers developing skills for only one or two parts of the process. In her experience workers produced higher quality work when better paid and that more orders would make it possible to increase wages. For new designs, she stated that she often got ideas from customers. In the context of the university, Sumanatsya Voharn proposed an exchange of design students and craftspersons. Design students would learn lacquer techniques and use the knowledge of craft and material to generate design ideas. Craftpersons would study design to also generate new ideas. Sakurako Matsushima and Eric Stocker supported Jib’s exchange proposal. 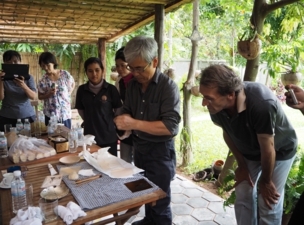 Taking Jib’s point further, Eric saw the importance of exchanges of craftpersons between the participant workshops to expand the range of technical skills. Sakurako and Chen Shuhwa then spoke of the importance of exposing young artists to quality lacquer art to stimulate and encourage them to use the material. 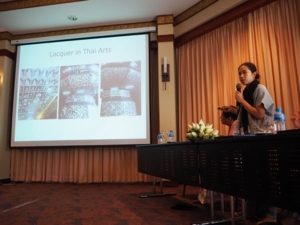 Sakurako stated that she hoped that the lacquer art exhibition in Chiang Mai would help young artists to awaken to the possibilities of lacquer art. Jib agreed that students tended to use acrylic and other modern materials and needed more exposure to the quiet and slow beauty of working with lacquer. Nanda Win Maung addressed some technical difficulties of working with lacquer, the time needed to remove water and the time it took to harden in particular. He bemoaned the lack of modern methods to speed up these processes. He agreed that in lacquerware was not considered an art form in Myanmar, but saw the need for more focus on artistry. Echoing a point that Jib made, Sakurako stated that lacquer arts and the Asian Lacquer Project in particular needed to make better use of social media such as Facebook and YouTube to reach a larger audience. And that this media and other forms of promotion will be important for the success of the upcoming events in Chiang Mai. Eric Stocker stress the need for all the members of the Project to keep in contact with each other. He offered the example of Urushi Barcelona that maintained Facebook page and a website for that purpose. All participants were in immediate agreement. Ken talked about the importance of raising public awareness of what exactly lacquer is. A small sign or leaflet explaining the material, its properties, and long history would help educate, he said. Eric said that he gave visitors to his studio one lacquer seed and asked them to plant it. Yoshie Itami discussed the possiblity of branding or trademarking lacquer. Just as to be labeled Champagne, the wine must be from a certain area or that chocloate must contain certain ingredients. Jib discussed possible themes for February’s Project Event in Chiang Mai. She suggested “From Past to Present” as a theme connecting lacquer’s long tradition to modern urban life. She also thought the event should stress that lacquer was a natural, sustainable, and local material. Eric asked her about the Royal lacquer plantation project and if it would be possible for participants to visit it, Jib said that she would investigate the possibility. Yuki Yashiro commented that the lacquer exhibition should have “touchable” lacquer objects so visitors could experience their lightness and texture. Saeko Ando stated that the situations facing lacquer art and industry were very different between each nation and that it would be best to first focus on the Chiang Mai event. She remarked that the public attending the Vietnam event would most likely be quite different. Jib suggested ways of promoting and marketing the Chiang Mai events. She said an Internet presence was essential. But in addition, she thought ads in art and culture magazines, and memorable posters might create interest. One example she offered was that of young people, possibly local celebrities, holding lacquer art objects and making a witty or catchy comments. Finally, ideas were expressed on the need to officially have lacquer and lacquerware classified as a cultural heritage. That having it classified as such would separate naturally made lacquer products from those made from plastic and chemical varnishes. This would pave the way for common trademarks and labelling. It was recognized that this was a long process, but that efforts in this direction were already being make in Japan and by Angkor Arts in Cambodia. Each participant was encouraged to begin the process in each situation and locale. At 06:00, participants boarded a bus for a 90-minute drive to a village near Stoung in Kampong Thom Province to visit Mr. Ta Ly, the lacquer sap collector who supplies Angkor Artwork. 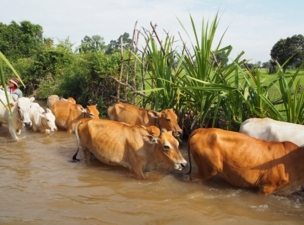 The group waded through inundated paddies to reach the trees. This was unusual for many participants who were accustomed to seeing lacquer trees in mountain forests. Ta Ly demonstrated how he tapped the trees. His tools to cut away the bark and method of attaching the bamboo cups were quite different than those used in Myanmar and Thailand. The bamboo cup itself is longer and attached below the cut a more vertically than by collectors in the other two nations. Ta Ly said that it was just beginning of the collection season. He answered questions about the amount his was able to collect. Some questions asked were how fast the cups filled with sap, and how much each tree produced, and how many months per year he collected. 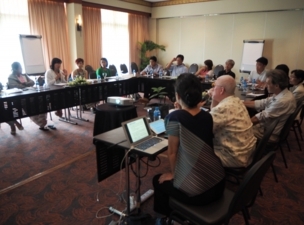 The field seminar gave participants to talk more informally. 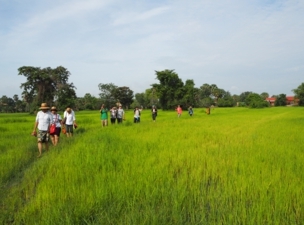 The trek through the knee-deep water of the rice paddies was fun and a good chance to bond. The Stocker brothers showed the group their studio and workshop. They demonstrated various techniques and answered questions about artistic sense and design as well as about worker training and other aspects of their business. 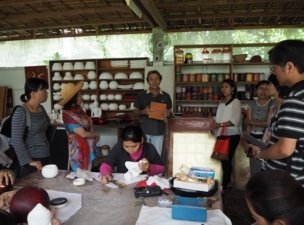 Participants from workshops in Myanmar were particularly interested in the materials, designs and techniques used. Discussions were animated. 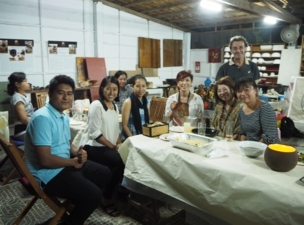 In the evening, there was a barbeque party at Angkor Arts with many friends from the Siem Reap community attending. It was agreed that the project needed a social media presence in order to better communicate to each other and to promote a better understanding of lacquer arts, crafts, and culture to the public. Eric Stocker first spoke about Current State of Cambodian lacquer. About Current State ofJapan, Myanmar, Thailand, and Vietnam lacquer.